After a quick jaunt back to the 1895 landing site - I'd bumped into one too many sextellegers and was in dire need of Dr. Blood's services, not to mention I'd forgotten to take down the coordinates the last time I was there - I followed Buffalo Bill's directions toward Cooter's place. It was a slightly roundabout route to take an accessible bridge across the canal and then into the entrance of the labyrinthine canyons that Cooter called home, and I found myself swarmed by a good-sized... herd? pod? cluster? of creeping cacti. 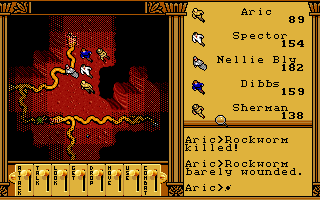 Poking around the canyons themselves was occasionally punctuated by the bounding of jumping beans, and between them and the cacti, it was a nice refresher on Ultima VI's combat engine and a very nice source of experience. 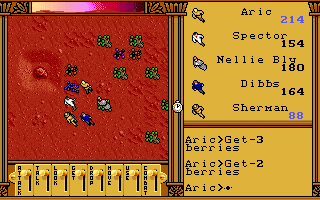 Buffalo Bill had stated a few of the Martian berries might prove necessary to get into Cooter's place before supplying us with some, and his statement proved true. Eating one of the berries bestowed temporary telekinetic powers, and this allowed us to move a board and cross a small chasm at the entrance of the McGee abode. Nobody was home, but some rummaging around provided swift answers - we found a note from an "R" demanding Cooter reveal his oxium sources and bring his map to Coprates Chasma, and another from Cooter himself (with rather poor spelling) saying that he hid his map from Rasputin. This was enough for us to piece together what had happened, but before we headed off to the Chasma itself, we poked around to see whether there was anything else of use in the caverns. We certainly did, too. There proved to be a hefty amount of oxium in the caverns, some of which was guarded by ammonoids, but when all was said and done, all four of my little band of adventurers had enough oxium to last them a good long while on the surface of the red planet. With our oxygen needs now seen to, at least for the foreseeable future, we wound our way through the canyons to what we surmised was the designated meeting place in the Chasma. And sure enough, we found Cooter himself, hidden behind a narrow passageway blocked off by a large trunk. He was quite relieved to be rescued, saying that he'd been captured by Rasputin and his "varmints" at Argyre, over his knowledge of the oxium stores on the planet. He mentioned one in particular, a motherlode of the stuff beneath the station at McLaughlin - the only problem was that it was behind an electric-powered door, which would not open unless power could be restored. Mr. McGee suggested that Edison, one of the expedition members holed up in Olympus, would probably be able to figure out what needed to happen there, and in the meantime, told use where he'd buried his map to the motherlode, just outside the entrance to the Chasma. It was an easy effort to find said map (and I was rather amused that I needed room to 'move' the dirt I was digging up in order to do so, a nice touch), and from the looks of it, the motherlode was east of the Xanthe Terra, nestled in a corner by some canals just to the northeast. 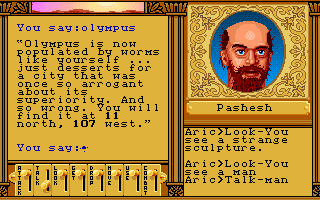 I made a note to look into it when I passed by the area, but for now, it seemed clear Olympus was my next destination. We picked our way back out of the maze of canyons, aiming for the settlement - and once again found ourselves facing a veritable wall of creeping cacti standing in our way. Aric and Dibbs bravely flung themselves onto the front lines, with Nellie Bly and Spector taking potshots from the sidelines. All was a flurry of sap and sabers and shells and needles, but they just kept coming! I think when all was said and done we'd somehow managed to beat back upwards of thirty cacti, and the sap we'd spilled there on the edge of a canal might have gone a decent way toward filling it. We were mostly unscathed, save for a few scratches, but weary, and by the time we came to the gates of Olympus, we were aching for a safe refuge and a friendly community to catch our breath. Unfortunately, we would not find it at Olympus. Nathaniel Peters, the gatekeeper, expressed a good deal of skepticism, saying nobody could be let in unless they held proof of their soundness of mind. After an incident at Elysium that drove the denizens there mad, the occupants of Olympus were taking what they saw as all necessary precautions. It was just as Dibbs had suspected, and sure enough, he too had been away for long enough that his assurances were worth little to Mr. Peters. He informed us we'd need to seek out three men known to be of sound mind at Syrtis Major, giving us an affidavit for them to sign. If they could vouch for our character and our sanity, then we would be allowed in to Olympus. So off we went to find a way to Syrtis Major. This took a fair amount of wandering, on account of the fact we had to find some way over the canals, and since the power was off, we could only make use of the bridges that had already been lowered. We also desperately needed to resupply, and so we made another trip to Calamity Jane's using a considerable portion of the oxium we'd found in Cooter's place to replenish ammunition. After this particular adventure, I find myself less worried about the economic balance, using oxium as both currency and means of keeping the party in tip-top fighting condition. What supplies I had depleted at what I felt was a very reasonable rate, meaning that by the time I needed to actually spend it, I had at least a decent sense of what a "reasonable" stock was, and thus how much I could afford to spend. I'm still a little concerned about how quickly I'm going through bullets, but that feels like a much more manageable situation in my mind now - now that I had a couple levels under the gang's collective belts (more on this later), I feel more confident sending them into melee range now that they don't seem quite so squishy. It's interesting to see snippets of Martian history. In my wanderings trying to find a way to Syrtis, I stumbled across the station I suspected Cooter's motherlode might lie beneath. It turned out there was a whole network of caves there, and some complicated-looking equipment connected to a conveyor belt and a large furnace. There were also two mechanical men present! Talking with Coker and Stoker, as they called themselves, we learned that this was the place that powered Mars. Coker dug out coal and placed it on the conveyor belt, and Stoker took the coal off the conveyor belt and moved it into the furnace. The power produced by burning the coal was sent to broadcast towers on the eastern end of the mine tunnels, and from there sent across the planet. The process had come to standstill because one of the conveyor belts was in need of repair - Dibbs chimed in to suggest that Trippet at Olympus might be able to do something about that. 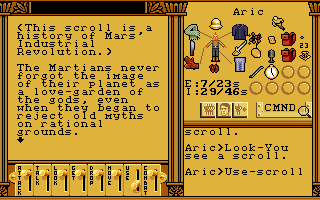 Further exploration of the caverns revealed some closed doors (Stoker had confirmed there were large stashes of oxium behind one), a scroll detailing the Martian Industrial Revolution, and a bag containing a seed and pod knife. That last one seemed somewhat important, so I took it with me. Eventually I made my way back out and finally found a bridge to cross the canals, just behind Olympus itself. D'oh! Oh well, the exploration would surely come in handy in getting my bearings. After a long trek and a night's rest, we finally made it to Syrtis Major, where we found David Yellin, one of the three men Nathaniel had told us to find, in a panic. He and his two companions had been searching for more iron to use for Carnegie's cannon to return to Earth, and the others had been trapped within the mine they had found by a cave-in! He directed us to a repair drill, but it needed to be put together and placed on a cart to be used properly and dig Sherman and Duprey out. Mr. Yellin lacked the tools in order to do so. However, we did not! Spector was carrying the tool kit we'd taken with us from Tesla's own cannon, and so he made quick work of putting the drill together. 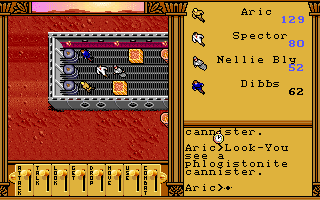 We pushed it into the mines, and after a fair amount of drilling past large rockfalls, we found two rather familiar-looking and very grateful men. Sherman in particular was thankful enough to join with us, citing his familiarity with several places on Mars. Another pair of hands was very welcome, so we were glad to have him with us. (Although I'll admit I'm a bit confused why he was carrying a copy of Dante's Inferno - and doubting how accurate the translation was, judging from the typo in the Italian title.) Anyway, the three of them took the incident as evidence of our sound minds, and were more than happy to sign Nathaniel's affidavit stating so. With the three of their signatures, we had everything we needed to enter the community of Olympus, and from what we had heard on our adventures thus far, we had plenty of business to see to there. It was time to get to work. In my wrap-up for Savage Empire, I said that I never had a good sense of character progression, most of the choices for party members already being near max level already and any actual improvement coming sporadically and only for specific characters. I find that I'm having what's basically the opposite problem here in Martian Dreams. I'm absolutely drowning in experience, and that was even before the Shootout at the Cactus Canal! Every time I rested, I had at least three party members ready to level up. The Avatar's already hit level seven, and Nellie, who started at level one at the game's beginning, is ready to hit level six the next time I rest. The levels are coming very fast and furious, which means I expect it to taper off considerably, and probably in the not so distant future. Still, I think this feels like the better situation - I definitely feel like my characters are getting better this way! Even if I hit the level cap for these guys somewhat early on, at least I can say I've had some input as to how they develop, which is, I think, a preferable situation in what's at least ostensibly an RPG. I've even managed to avoid the die-hard need for strength I encountered in Savage Empire, and while most of the levels my group's achieved thus far have been spent improving strength, I've felt I have enough room to give Spector a bit of a boost to dexterity as well. 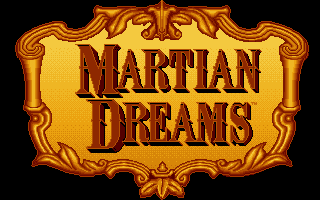 All in all, I like how Martian Dreams is handling the experience a lot better than its predecessor. Of course, all those levels need to be used on something - hopefully the denizens of Olympus will give me plenty of leads to do exactly that! Found this outside Olympus... iiiinteresting. Weren't you like level 7 in Savage Empire? 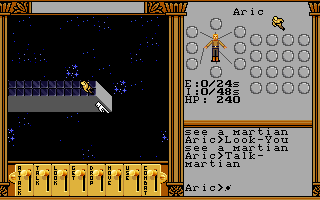 My adventure on Mars began the same way most of my travels through the Ultima series begin: wrapping my brain around the control scheme and figuring out what the heck I have to work with. That was a relatively simple affair as far as Martian Dreams was concerned. 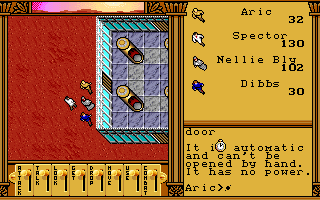 It didn't take very long at all to slip back into the groove of the Ultima VI engine (though it did take me a while to remember that it's B and not C that switches in and out of combat mode). 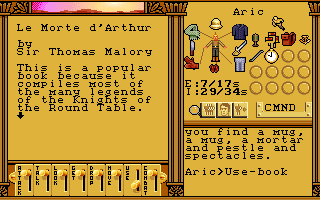 There wasn't that much in my inventory to take stock of either, mainly clothing that was already equipped, a pocketwatch, and Nellie Bly's pistol. 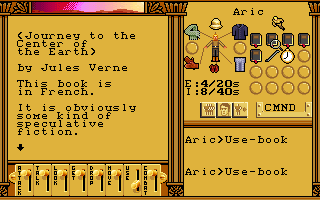 I also took a moment to take a peek at my little band's stats, and already found myself with one improvement over Savage Empire: Aric was my most highly experienced character, and even he had some room for growth. One of my complaints about Savage Empire was how little development it felt my characters were experiencing over the course of the game - here in Martian Dreams, there's lots of space for improvement. I'm still a little wary over carrying capacity and inventory concerns perhaps making the actual stat growth choices... less of one (does intelligence even have a use in this game, since there's no magic?) but that's a bridge I'll cross when I get to it. In any case, I suspect the possibility of more frequent levels, even if it just ends up being extra HP and a point of strength, will help alleviate the problems I had in the previous game of that nature. Now that I had an idea of the characters I'd be bringing along with me on this excursion, it was time to... well, get an idea of the characters I'd be bringing along with me. (Ah, language. Gotta love the multiple ways certain turns of phrase can be interpreted.) I had a sense of what I might be able to expect from them gameplay-wise, so I next took a moment to get a sense of who they were. Spector assured me of his desire and ability to assist - and asserted it was his job to keep the Avatar out of trouble - before remarking once more upon the differences between what modern science said of Mars compared to their current experience of the Red Planet. Nellie Bly told me a little bit about herself, speaking of her experience as a journalist, her chosen pen name, and the notes she would take about the expedition. It seems she'll fulfill a similar role to Jimmy in Savage Empire, in effect functioning as a walking, talking quest log. 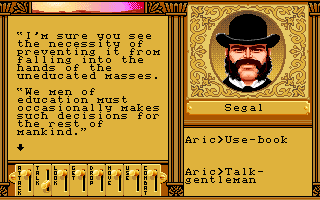 This is something I do appreciate about the Worlds of Ultima games, in essence keeping track of at least the highlights of important plot points right there in game. Makes it easy for a quick reminder of what the player maybe should be doing right about now without drowning them in detail. I feel like with the sheer amount of content and sidequests and detail in modern games, it can be a bit difficult to parse a quest log for the immediately important bits, and the simple approach used here feels like a good way to go about it - keep track of the Big Relevant Plot Things, and leave whatever else the player chooses to pursue to their own recollections. What's steampunk without Jules Verne? --only to be stopped by Tesla and the copy protection question. 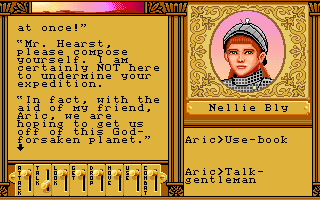 The structure of this entire opening put me very much in mind of Ultima VI, in a good way - an enclosed space to take stock of the situation, prepare for the trip ahead, and get a sense of what direction to head first. 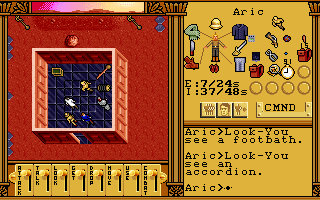 It's all even locked off the rest of the game world until you obtain a certain item within the designated area and pass the copy protection. The main difference is that the space capsule here is a lot smaller than Lord British's castle! One other detail I enjoyed about this first little area: the crew will readily give their opinions on everyone else, and they're varied. For instance, Tesla is eager to speak with Freud about his dreams, interested in what the psychologist has to say, whereas Garrett is skeptical of Freud and things he asks too many questions. Characterization is as much defined by relationships as it is to an individual's character traits, so it's nice to see the "crew" of the expedition taking the time to say what they think about each other. Really helps get a sense of what sort of team this is. Gotta include the drama shot! Anyway, after another admonition from Blood to find some way to deal with the oxygen situation, we set forth to find the landing site from the mishap in 1893 that necessitated this whole rescue in the first place. It was a rather uneventful journey, being a fairly easy walk to the east. We only encountered a couple creepers along the way, which were swiftly dispatched without difficulty. Upon reaching the site, we met with one Lieutenant Dibbs, who had been working security for the capsule when it fired. He had been waiting for the rescue party, and had much to tell us of what had happened in the intervening time. It seemed that the previous group had been working on building a capsule to make the return trip, but needed to find more iron for the steel necessary to build it. They split into four groups, each seeming to take their own tack on the situation. Rasputin took a group to Argyre to research the Martian technology there, and they became secretive and reclusive. It was clear Dibbs did not trust them much. Lowell took a group north to Elysium, experimenting with the Dream Machine they found there. According to Dibbs, there were several around Mars, though only Elysium's seemed to work - and Lowell's group went mad as a result, now believing themselves Maritans. This led the group led by Jack Segal to become skeptical of those potentially "contaminated" by the machines. They remained at Olympus to work on the shuttle, and effectively closed themselves off from anyone who may have come into contact with the active Dream Machine. Dibbs suggested we visit the fourth group, the traders Buffalo Bill and Calamity Jane, at Arsia Mons for further equipment and supplies, including, he mentioned, a potential source of an oxygen-rich rock that they had discovered on the planet. This sounded like a capital idea, so after rummaging through the supplies left in the capsule (including a copy of Le Morte D'Arthur, as if I needed another reminder of where the series could have gone!) we headed east once more, heading for the coordinates Dibbs had given us. Once again it was a fairly uneventful trip, only stumbling across a small band of bushrats (what would the proper collective term be for plantimals?) that were quickly dealt with. We were, however, beginning to see traces of civilization - the remnants of a road that we were indeed following toward Arsia Mons, at least in part. Buffalo Bill and Calamity Jane were willing to trade a wide variety of things for oxium. Though we didn't have much on us at the moment (Dibbs only had a little), it was good to know if we were ever short on supplies or ammunition, they'd set us up for the right price. They also mentioned various varieties of berries they'd trade for, with mysterious effects. Calamity Jane would even give us oxium, for enough of the right kind of berry. Dagnabit, do you have to rub it in my face like that? Or would, at least, once her supply lines were back in order. It seemed her supplier, a man named Cooter McGee, had gone missing. Dibbs had mentioned this as well, it seemed he had fallen afoul of some raiders from Argyre. Yet another reason to be suspicious of the group that had holed up there. We promised we'd look into what happened to him, and at Jane's instruction, Bill gave us directions to Cooter's place and a stock of oxium to help us deal with the atmospheric conditions during the journey. Rather, he did once I reloaded a save. 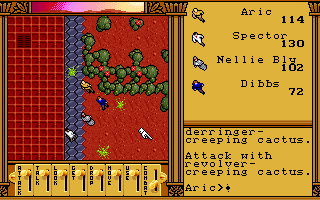 I'd somehow managed to skirt past a pair of sextellegers just outside the outpost, and one had snuck through the open door and smacked Bill dead in one shot. Whoops! I made sure to get the drop on the sextellegers first the next time around, and for added safety I shut the door behind me once I was inside. C'mon Bill, you can't die yet, this is how universe-shattering paradoxes are made! I called it a session there, as I'd spent a good deal of time in the game at this point. 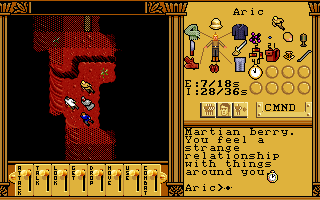 It may not reflect a whole lot of things actually happening, but I think this opening bit of Martian Dreams works really well, a nice and tight means of getting the player into the game. There's a good sense of what's happened in the game world and what I might be able to expect moving forward, several plot threads to follow up on - there are, after all, four groups from the previous expedition to chase after - and one prominent one that gives me a clear direction for at least my immediate steps. The game does a good job of streamlining the open world so it doesn't feel overwhelming in these initial stages, which I feel is necessary when you're still getting the hang of things. I feel like I have options, and even though it's clear to me where the game wants me to go, it manages to do so in a way where it feels like I, the player, am still the one calling the shots as to where to go and what to do next. I do, however, find myself with a bit of trepidation over the oxium mechanics. On paper, I find the concept an interesting one. It's necessary to keep the party in tip-top fighting condition, but it also doubles as currency, which means as the game goes on and I accumulate a larger stash, I may have to make decisions about how much I can afford to use on buying supplies and how much I need to keep on hand. The fact my currency stash will dwindle as I travel as well means I can't just hoard and use it whenever. There's the possibility of needing to be a bit more judicious about when I take my shopping trips. I'm sure this is just flavor and won't be of any importance. In practice, though... I feel like this could be a tough thing to balance properly, economically. Considering a lack of oxium lowers my stats - and by proxy, carrying capacity, ouch! - it'll be important to keep it on hand, but since a lot of the weapons require ammunition, I'll constantly be in need of replenishing bullets, which means spending "money." I don't know how much oxium I'll be able to find (or berries to exchange for it in if I can't find enough), nor do I yet have a good sense of how quickly one goes through a stash of it in travels, and depending on both those factors, it could mean I'm constantly in want of more of it not just to buy things, but to maintain enough of a supply of it to make it to where I want to buy them. And that's assuming I don't care about keeping any on hand to keep my stats up. I suspect I'm just overthinking things and it'll turn out just fine, but I'm seeing some potential for the mechanic to end up a bit frustrating if it's not fine-tuned well. I suppose we'll see as the game goes on. 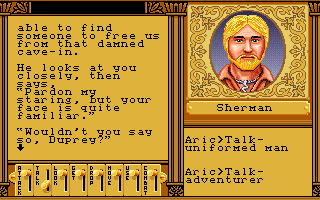 Finding out what happened to Cooter is my plan for the next session, maybe wandering over to Olympus once that's taken care of. An entire planet's worth of adventure awaits - time to get back to it! I think the best way to encapsulate my initial thoughts on Martian Dreams is via a remark from a conversation I had during the UDIC 25th Anniversary Bash. Unfortuantely I don't remember who said it, so I'm unable to attribute it properly, but it went something along the lines of "Just describing the premise of that game makes me happy." That's a pretty fair assessment for me as well, all things considered. 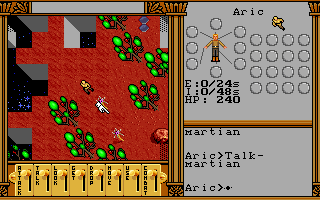 Released in 1991, Martian Dreams was the third game to make use of the Ultima VI engine and the second entry in the Worlds of Ultima spin-off series. 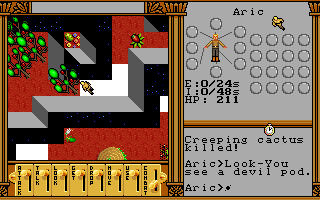 Or at least it ostensibly was, as the series itself had been renamed to the "Ultima Worlds of Adventure" series, putting the prestigious name of Ultima first. Not that it mattered all that much in the end, on account of the fact it was also the last entry in the series, much to my personal dismay. See, the planned third entry in the series was intended to take an Arthurian bent - how awesome would colliding Britannias have been? Iolo and Merlin swapping stories, Dupre and the Knights of the Round Table questing together, King Arthur and Lord British... so many great opportunities there. But alas, it never came to be. Ahem, right. I was talking about Martian Dreams. 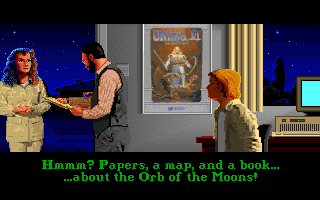 I like the fact the Avatar has a poster of Ultima VI on the wall. 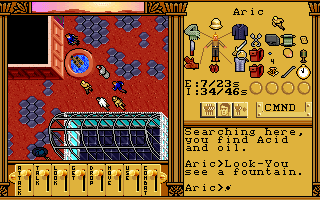 Once again the game took the tack of throwing the Avatar into an adventure apart from Britannia, via the Orb of the Moons. While Savage Empire took him into a lost world, Martian Dreams sent him on a steampunk adventure on the Red Planet. Considering time travel is involved, it's a little difficult to properly decide where the story truly begins (or a least when), but perhaps the best way to approach it is the Avatar's own perspective - when Dr. Spector shows up on his doorstep one night, ostensibly at the Avatar's own bequest, the two are visited by a mysterious stranger with a package for them. This package contains a photograph of the two of them with several Victorian-era figures, a note signed by Nikola Tesla, and a book on time travel and the Orb of the Moons written by Dr. Spector himself - dated a century earlier. Following the instructions laid out in the book, the two venture to an abandoned laboratory in Colorado, use the Orb, and find themselves in the year 1895. They discover that two years prior, the astronomer Percival Lowell had developed a "space cannon" designed for a trip to Mars, unveiling the project at the Columbian Exposition of 1893. Unfortunately, the cannon discharged a day early - with several prominent figures of the era on board for a tour. And so the Avatar and Dr. Spector join Tesla's rescue mission, for whatever adventures might await them on the next planet over. 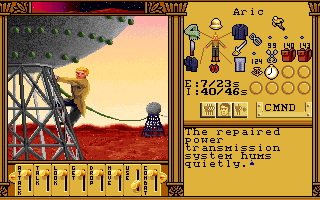 Much like Savage Empire, I don't have a lot of previous experience with Martian Dreams. 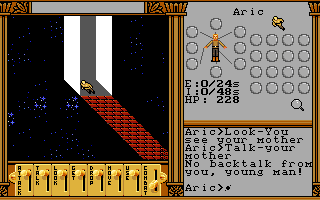 This was largely in part due to the interface issues I had with Ultima VI, which I've previously stated that I had several problems adjusting to at first. 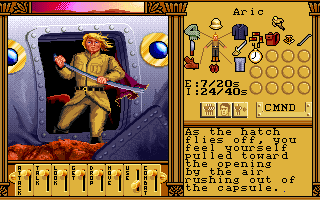 However, the premise reminiscent of a Jules Verne novel (adaptations of which I read voraciously as a kid) intrigued me far more than Savage Empire's, and so I was a bit more willing to stick it out just to see what the game had to offer. I've never managed to get very far in the game, but I loved its aesthetic and the ideas behind it. It's one of those games that I quite readily praise even if I'm not entirely sure it's one that ends up clicking with me personally. 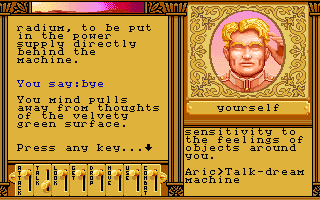 Although considering how I've managed to get over my initial problems with the Ultima VI interface back during my playthrough of that game, I suspect I'm going to have a much better time of it this attempt around. I'm excited to experience the story firsthand in its entirety, because from what I've seen of it in Let's Plays, it's going to be an excellent adventure. Well if we knew, we wouldn't have a game, now would we? But of course I can't get started without delving into the game manuals - yes that has to be plural, as Martian Dreams came with two! 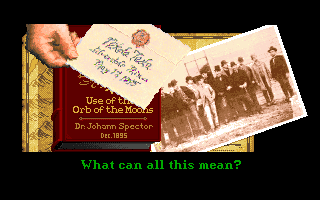 The first is Dr. Spector's treatise on time travel and the Orb of the Moons referenced in the game's intro. It does indeed explain how the Orb of the Moons can be used for such a thing, and they are indeed followed properly in the intro. It also features a few descriptions of the various people in the ill-fated 1893 journey, along with those taking part in the 1895 rescue expedition. The second manual describes more of the planet itself, from its geographical features to the wildlife encountered there to what they have managed to figure out of the Martian civilization. It's clear that the team put a fair amount of research into the historical figures they chose to include, there's even a "Further Reading" section for more material on these people. That sort of thing is something I highly appreciate in games that reference historical peoples and places - part of what I love about the Civilization series is trawling through the in-game Civilopedia to learn more about the people and nations I'm playing as. Being able to latch on to some little-known facet of history and having resources at hand to investigate further, provided to me by the game itself - that's the sort of infectious passion for a particular topic that I love to see infused into any form of media. The manuals also help set the proper tone for the game to follow here. There's no such thing as a perfect reflection of reality when it comes to fiction - what matters is either being able to sufficiently distract the audience from those discrepancies, or putting them in a state of mind where those discrepancies and inaccuracies simply don't matter to them. Martian Dreams is of the latter type, I think. It definitely plays fast and loose with the science involved (when it doesn't outright defy it! 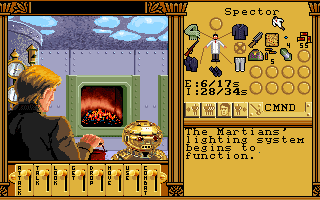 ), but the lighthearted tone of the manuals and intro sequence help put the player in the right mindset, that this isn't going to be a story about hard science and survival on Mars, but a jovial adventure that happens to be set there. 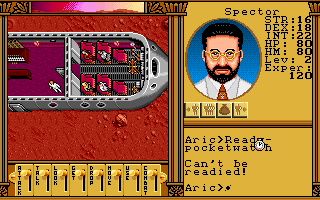 Spector himself even points out some of the strange and extraordinary discrepancies between the modern understanding of Mars and the game's presentation of it! By presenting them in an almost jaunty sort of manner, it helps set the player's expectations of what's to come and make those nonsensical moments easier to accept and meet the game on its own terms. Origin did "create worlds," after all. Even the detail work in the manual and opening sequence makes me grin. The illustrations that supplement the descriptions of Martian "plantimals" really help bring the idea of plant-based fauna to life, and the added detail that it's George Washington Carver who does the research into Martian society and its life cycle makes just drives it home all the more - of course he would, he's the botanist! All in all the manuals go a long way to getting the player in the right mood for the game to come, which is exactly what they should be doing. 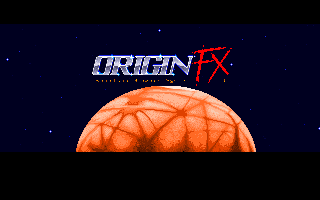 The fact the Origin FX sequence at the beginning uses an image of Mars made me smile, too. 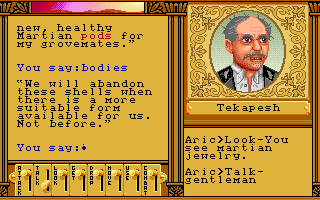 Thus prepared, I popped into the game to create my character proper, chatting with Sigmund Freud in order to define the Avatar's presence on Mars. Even this is a nice touch - who else would be the one to determine how the Avatar would be fleshed out on this particular adventure? 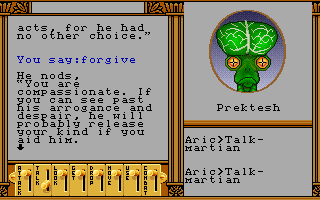 Freud began by asking whether the Avatar was closer to his mother or father - I didn't realize this was the 'art thou male or female' question of the game when I first gave Martian Dreams a whirl, which caught me off guard when I answered honestly and ended up female once I fired up the game proper. Freud then stated he did not think the Avatar belonged with them on the trip, and asked how that made him feel. From there came a few more questions: were the Avatar a child again, what would he do when his mother calls him away from playing with his friends? Should they send one out as a scout or stick together as a group when they land on Mars? Were he an animal, would he rather be a fish or a bird? Once again it was interesting to see the traditional "virtue test" framed in a completely different context, and as always, I answered based on the Avatar's previous experiences as best I could. All that remains now is to dive into the game proper and get to exploring the Martian landscape. Tally ho!